The Jagal Foundation is organizing and funding a PROJECT MANAGEMENT PROFESSIONAL (PMP) capacity building program for young adults between the ages of 18 and 40 years old. 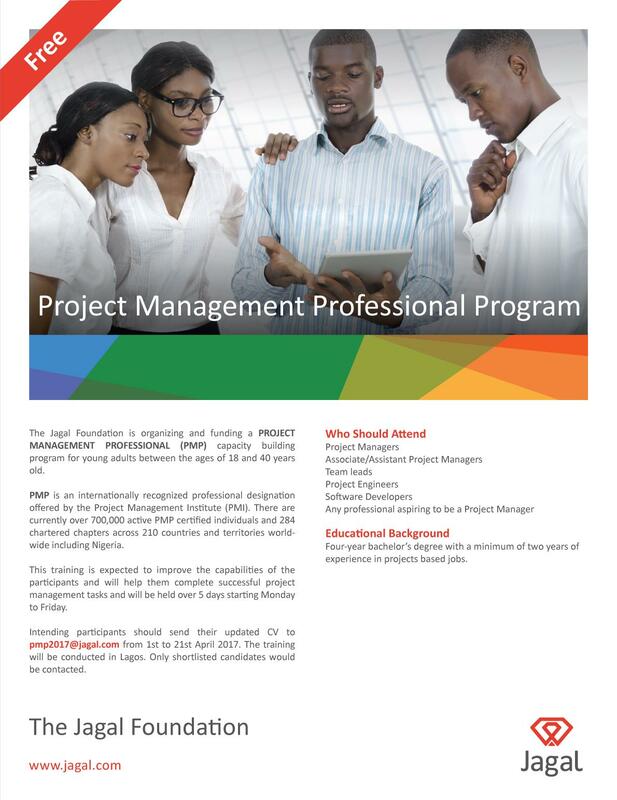 PMP is an internationally recognized professional designation offered by the Project Management Institute (PMI). There are currently over 700,000 active PMP certified individuals and 284 chartered chapters across 210 countries and territories world-wide including Nigeria. This training is expected to improve the capabilities of the participants and will help them complete successful project management tasks and will be held over 5 days starting Monday to Friday. Four-year bachelor's degree with a minimum of two years of experience in projects based jobs. Intending participants should send their updated CV to pmp2017@jagal.com from 1st to 21st April 2017. The training will be conducted in Lagos. Only shortlisted candidates would be contacted.